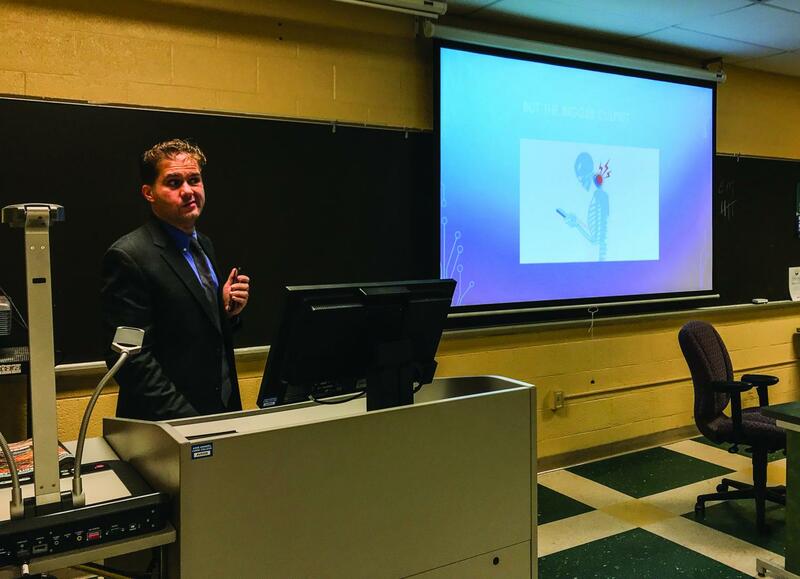 Neck pain caused by looking down at cellphones poses a problem for students, according to a chiropractor who spoke on campus in November. Dr. Cameron Hatam, who spoke to members of the student Health and Wellness Club on campus, described “text neck” as the unnatural curve of the spine, caused by bad posture from constantly looking at cellphones. To avoid neck pain, Hatam suggested, students should look at their phones, computers and TV screens at eye level. Maddison Wheeler, a first-year electrical engineering student, said she checks her phone about 50 times an hour. “I have had neck pain when I am sitting down and slouching while on my phone,” Wheeler said. Wheeler said she hadn’t heard anyone refer to her symptoms as “text neck” before Hatam’s speech, but said she wasn’t surprised it is a problem. Hatam mentioned an app called “Text Neck Indicator,” which monitors the user’s posture and triggers notification lights to alert the user to change to a new position to relieve neck pressure. “The app notices your texting position and gives you a red warning light when your neck is getting too much pressure, and a green light when you’re in an optimal viewing position,” Hatam said. According to a 2015 study by Common Sense Media, teenagers spend an average of nine hours per day on their phones. After the speech, Steve Lu, a first-year history student, said he had never heard of text neck. English professor Margaret Boas said she does not think she is at risk for text neck because she isn’t on her phone for the majority of the day. Hatam also spoke about headaches resulting from text neck. Hatam, whose practice is in Alexandria, Virginia, said relying on medications to relieve neck pain can impair a person’s cognitive ability. Nursing professor Karin Haynie said she only looks at her phone for short periods of time. “Having a constant habit of looking at your phone while walking or sitting is a problem because you’re not paying attention to the placement of your neck,” Haynie said. In addition to neck pain and headaches, Hatam pointed out the more serious complications that text neck can cause.